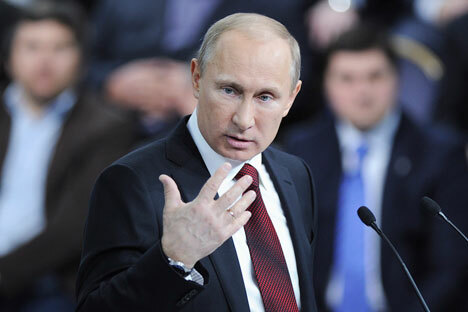 The inspections sparked concern in the West that Putin was attempting to clamp down on criticism of his rule. Source: Reuters / Vostock Photo. Inspections of two Russia-based German foundations by prosecutors as part of a blanket audit of NGOs launched in February have triggered a strong reaction from the German government. Russian President Vladimir Putin looks set to face questions over the unannounced inspections of hundreds of non-governmental organisations across Russia in recent weeks when he visits Berlin for talks with German Chancellor Angela Merkel on April 7-8. “I don’t know how sharp the nature of the exchange of opinions will be, but you know what the mood is ahead of the visit, and it is clear the chancellor will raise the issue of NGO inspections,” presidential aide Yury Shashkov told journalists on Friday. The inspections, which have also hit a number of religious and cultural groups seemingly far removed from politics, sparked concern in the West and allegations from opposition figures that Putin, whose return to the Kremlin last year triggered mass street protests, was attempting to clamp down on criticism of his rule. “Neither does anyone have a monopoly on speaking in the name of Russian society, especially structures financed from abroad and serving foreign interests,” he added. He also said, however, that law enforcement should avoid “excesses” as they go about their duties. The author of the law, United Russia lawmaker Alexander Sidyakin, disputed that claim in an interview with RIA Novosti last year. He said the law was intended to counter what he called attempts by the United States to “affect Russian politics,” echoing accusations by Putin in late 2011 that the United States was behind the protests against his rule. The inspections have frequently been filmed by television crews from state media channels which have aired attacks on Putin’s foes. The inspections have also affected a number of German NGOs, prompting a critical statement from German government spokesman Steffen Seibert. He also said Merkel intended to discuss the inspections with Putin. The criticism comes amid a cooling of once warm ties between Moscow and Berlin, which has frequently expressed concern over the rights situation in Putin’s Russia. Russian First Deputy Prosecutor General Alexander Buksman on Thursday dismissed accusations that the inspections were aimed at intimidating rights groups.